The Pitzer College Student Senate received a Certificate of Congressional Recognition from Congresswoman Judy Chu in recognition of our high standards of excellence and outstanding achievements. The student representatives on the Pitzer College Diversity Committee received the Student Engagement Award as part of the 2016-2017 Student Leadership Awards at Pitzer College. Simone Bishara ’18, Lora McManus ’18, and Livi Barton ’18 were honored for their work on Diversity Committee–– proactively reaching out to community members to learn how best to support students, creating an ongoing list of issues to address, and working tirelessly toward solutions. 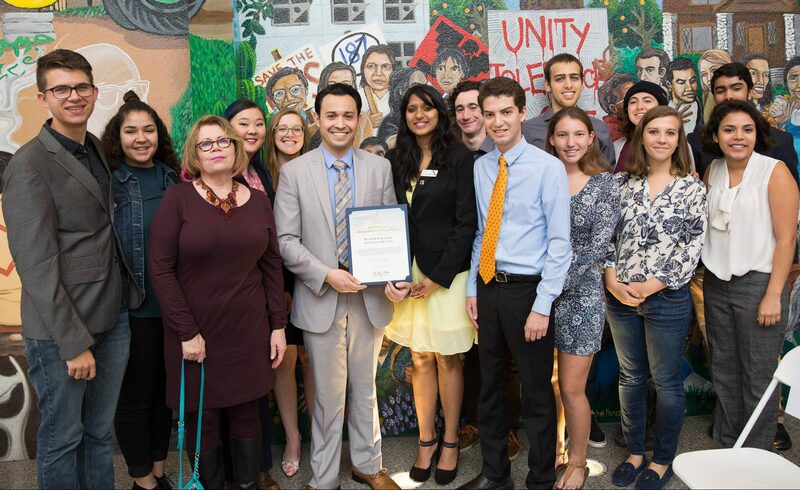 The Pitzer College Student Senate received the “Interdisciplinary Learning” Award as part of the 2016-2017 Student Leadership Awards at Pitzer College. We are proud of exemplifying the cross disciplinary approach to involvement on campus. In 2017, The Princeton Review ranked the Pitzer College Student Senate the #3 most active student government in the country! We are proud of serving our student body and being active participants of the shared governance at Pitzer College.